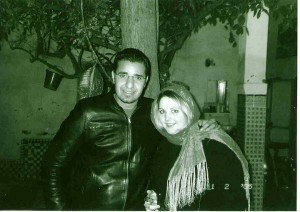 In the winter of 2004, I walked down a crowded street in the kasbah of Marrakech. It was a time in my life where I wasn’t looking for anyone or anything, simply escaping from the realities of life. As fate would have it one evening as I walked I felt someone next to me. I looked up and as our eyes met there was a flash in my mind…. This is him, you’re going to marry this guy! Quickly I tossed those notions out of my mind and ignored the man. But he tried to talk to me and so I did my best to communicate. But he didn’t speak English and I didn’t speak Arabic. We fumbled through on some lousy high school French I had managed to retain. The back story was that my younger sister had met a guy who had called one of his friends to keep my sisters’ friend (who was also on the trip) company. But because they couldn’t communicate I did my best to play translator. At the end of the evening I couldn’t push this guy out of my mind and asked the friend if she would mind if i just talked to him – she did not. The next day we spent as much time together as possible. As we walked down a back alley of the medina to a cafe, he turned me towards him and gave me a kiss. It was a movie kiss. My leg popped, my head floated, my heart was racing. (and it still does every time!) But sadly, we had to part ways the next day and in my heart I felt that it would be the last time we saw each other. We exchanged emails and phone numbers but I never held out hope that he would contact me again. But we did keep in touch and in a few months, over spring break from university I had booked a ticket for a short visit and found myself again in Morocco. The time went by so fast but we managed to get away by ourselves for a few days to Essaouira. He also asked me to marry him. Sure it seemed fast and crazy but when you know, you know. When we returned to Marrakech there was a celebration in the works for our engagement. 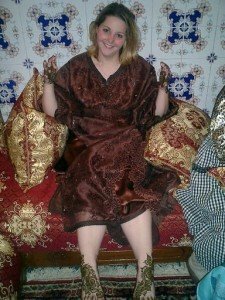 A trip to the hammam, was followed by getting dressed in a traditional takschita and having henna painted on my hands and feet. I truly felt so special. For dinner there was a fantastic chicken dish that is my absolute favorite. It was a shame that the evening had to end. It wasn’t long until my vacation was over and I had to return home…. but from there on after MarocMama and MarocBaba were meant to be….. Things were not always easy for us. I’ve written about our experiences with my family and starting our own family on Multicultural Familia. I’ve also shared some of the challenges of dealing with immigration and the notions people have about marriage to an Arab man. But all of it has made us stronger. I am so happy to have met and married the man I always dreamed I would find – even if he was on the other side of the world! …..Have a Happy Valentine’s day dear friends. Be good to the ones you love! Finding your blog has been a big relief and I loved reading your story. I came across your beautiful blog website through a Google search as I was looking for some information about travelling to Marraekesh. I loved your great tips and then I was browsing your blog. Having read this fairy-tale like real story I was so happy. I wish all the best of the world for you and your family. I am from Bangladesh and I invite you and your family to visit my lovely country. Thanks very much for sharing this great post. Your romantic story epitomizes challenge to surmount the boundaries that were initially invented for political goals but have been unfortunately adopted even culturally. I wish you a happy life and your love to remain stronger. Mash allay very nice turn in your life. I liked the page and all post very informative. I am from Pakistan married in Morocco. Really they are wonderful people. MashAllah your story is so sweet 🙂 I am American and I married a Saudi. Hi – I’m not sure why the link isn’t working but it should load the full story! This is such a wonderful story!! 🙂 Made my heart smile. 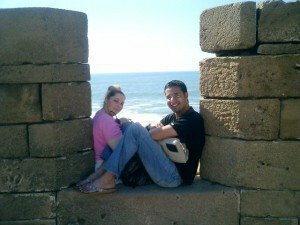 I found your story through Pinay on the Move, we were both featured in the Best Love Stories from Travelers Around the World post. Awesome story, congrats! Amazing how you really do find love when you least expect it. What an AMAZING story — totally book worthy! CONGRATS!!! What an awesome story! You guys looks so happy in the pictures! Salaam! Oh, what a cute story, it brought tears to my eyes! I just came across your blog through the Multicultural Blog Hop but I’ll stick around for a while to read some more posts. 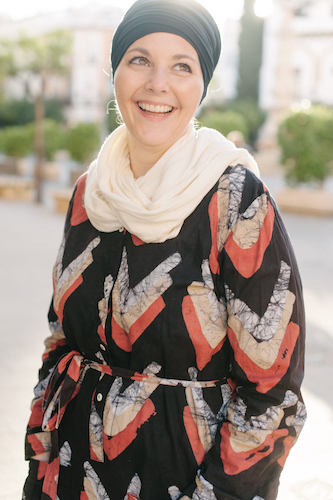 I was also married to a Moroccan for a very long time and have 2 wonderful boys, but unfortunatelly things didn’t work out for us and I moved away from ex-hubby – to Morocco, on my own with 2 small kids and without speaking Arabic! Now I’ve been back home in Spain for 2 years but I sometimes miss Morocco soooo much! Morocco is a whole different world… B’slema!!! So glad that you’ve found my blog. Looking forward to following yours as well. had u converted then? j/k. It is such a sweet story! MashAllah. And now MarocMama and MarocBaba live happily ever after, w/ two boys…..
That story was meant for Valentines Day. You two are wonderful.